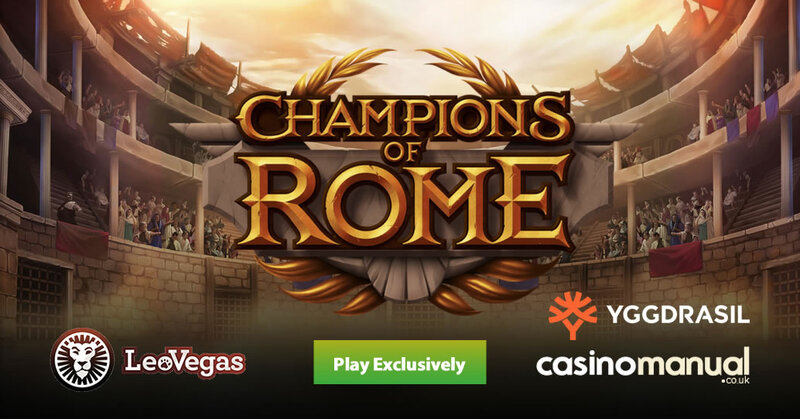 Yggdrasil Gaming will be releasing the Champions of Rome video slot on the 21st of February (2019) – however, it’s available exclusively early at LeoVegas Casino. 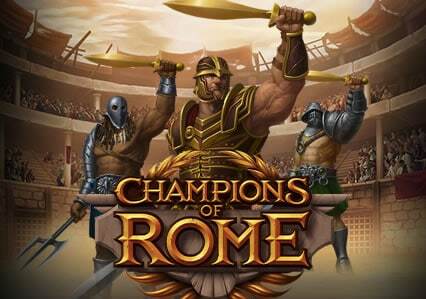 Champions of Rome has an ancient Roman theme and comes with 5 reels and 20 paylines – playable from as little as 20p a spin on all compatible devices, you head to the colosseum where mighty gladiators prepare for the ultimate battle. Visually, it’s stunning as you’d expect from a Yggdrasil Gaming production. There’s a Gladiator feature where weapons are thrown at the reels to give you wilds – swords will give you 2×1 and 1×2 wilds whilst the mace will give you 2×2 wilds. The trident will simply add 4 random wild symbols. It comes with a Free Spins feature where 5 free spin scatters will reward you with 600 times your bet – you can also buy your way into the feature for 50 times your bet if you’re impatient. Here you choose your mode – Gladiator symbols will replace high value symbols with their weapon on every free spin for wilds (as described above). The Beast symbol also appears to reward you with additional free spins. When it comes to modes, the Training Mode gives you 8 free spins. If you choose the Deathmatch Mode, you can choose from 7 free spins with a doubling multiplier, 6 free spins with a 3x multiplier or 5 free spins with a 4x multiplier. Once in, you need to win 22.5 times your bet to keep your winnings – if you don’t, you will get 5 Training Mode free spins or a cash bonus up to 10 times your bet. Medium variance, you can win 4,800 times your total bet from each Deathmatch Mode free spin (due to the 4x multiplier) which is decent. For more details, and to try for free first, check out the Champions of Rome video slot review. Until Champion of Rome’s general release, you can play the game at LeoVegas Casino – with just under 1,200 video slots, they have other new games like Play ‘N Go’s Queen’s Day Tilt, Quickspin’s Ticket to the Stars and Just For The Win’s Shogun of Time. They have video slots from Novomatic, WMS, IGT, Net Entertainment, Thunderkick, Blueprint Gaming, Barcrest and many others.